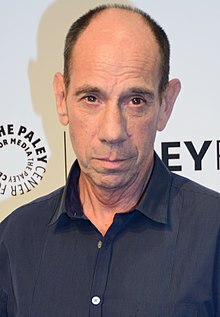 Miguel José Ferrer (February 7, 1955 – January 19, 2017) was an American actor. He was mostly known for villainous roles such as Bob Morton in RoboCop. He also voiced the villain Hun leader Shan Yu in Mulan (1998) and Big Boss in Rio 2. Ferrer's other notable roles include Dr. Garret Macy on Crossing Jordan, NCIS Assistant Director Owen Granger on NCIS: Los Angeles, Vice President Rodriguez in Iron Man 3, and FBI forensic pathologist Albert Rosenfield in Twin Peaks. Ferrer was born in Santa Monica, California to Academy Award-winning actor José Ferrer and singer Rosemary Clooney. His first cousin is actor George Clooney. He never went to college because he began his Hollywood career at an early age. His career began in 1981. He was married to actress Leilani Sarelle from 1991 until they divorced in 2003. In 2005, he married Lori Weintraub. They had three children. Ferrer died on January 19, 2017 from throat cancer at his home in Los Angeles, California, aged 61. ↑ "Miguel Ferrer, 'NCIS: Los Angeles' actor, dies at 61". Chicago Tribune. Chicago Tribune. Retrieved 19 January 2017. This page was last changed on 7 April 2019, at 04:06.